Smart Grids and Distribution System Automation (DSA) are common phrases in modern electrical vernacular which are often paired with the terms “Innovation” and “network efficiency”. Despite all the lauded benefits of the implementation of a DSA scheme, most end users find the increased complexity a bureaucratic nightmare to contend with. No matter how advanced the network assets become, the monumental challenge of addressing organisational works practices and training often leave automation projects unachievable. With rapid proliferation of automation capabilities in distribution networks, it is fundamentally necessary to test, train and maintain utility staff competency to implement these functions. In an international utility climate of optimisation and innovation, effective execution of efficient automation strategies is paramount. Through decades of installations of the OSM® series reclosers, NOJA Power have built an extensive suite of automation functionality. With the latest show of force being the NOJA Power SGA IEC61499 implementation, it is time to bring end users up to date in the rapid shift in technology. In order to achieve this level of training and familiarisation, what is ultimately required is the capability for a simple user interface for development, verification and training to all utility personnel which allows for a hands-on approach to the implementation of modern feeder protection, automation and communications. This level of interactivity is what is required for a field user to become familiar with the advanced capabilities of a modern recloser. For many years, manufacturers arrive at innovation after innovation, only to find field installations are diluted reclosers which only embrace their Overcurrent, Earth fault and maybe Negative Phase Sequence protection. With a fortune spent every year on DSA algorithms and assets, it would be cannibalising the utilities’ own investment to disregard the functionality available in these advanced recloser installations. There is however a solution to this challenge, the NOJA Power DSA Simulator. This comprehensive testing and training equipment is the latest innovation to share the concepts and benefits of network automation with all users regardless of skill level or use of equipment. By presenting operators with a large, hands-on interface arrangement of 5 NOJA Power RC10 recloser controlled ACRs in a ring feed arrangement, the protection engineer will have command of even the finest details of capabilities in network automation. In total simulation of a practical environment, the DSA simulator allows for load and varied fault generation at any point on any feeder. At the most simple level, this level of interactivity can show a user how an automation works, as the DSA simulator re-switches the simulated network to isolate the fault and restore supply to all other customers. This show of flashing lights is only the tip of the iceberg when it comes to training capabilities in the NOJA Power DSA Simulator. At the heart of each of the “recloser” points in the DSA simulator is a fully functioned NOJA Power RC10 Recloser Controller. As each of these recloser points is exposed to true three phase power supply, the training and function evaluation capabilities are unmatched. Simulations of a multitude of possible fault scenarios are made available by the toggle switches in each “Feeder” zone between reclosers, allowing protection engineers to demonstrate the latest in automation and protection to share knowledge between Engineers, or even explore new concepts and ideas in the engineering field. All the standard communications ports are also presented to operators, so whether in the training yard or the university classroom, SCADA testing and training has never been simpler. The capability to train personnel and students on SCADA concepts and protocols as varied as DNP3, IEC61850, IEC60870-101/104 or even remote engineering access allows for utilities to embrace the full gamut of functionality available in the assets they possess on their network today. As the DSA Simulator has a staggering total of 5 recloser control RC10 devices packaged with each unit, the simulator is also supplied with the full suite of industry standard software in association with the NOJA Power recloser. Today, the RC10 controller presents capabilities for Power Quality data acquisition, Automation and SCADA control in parallel with the standard protection functionality. With the availability of 5 controllers with true analogue signals available for reporting, it is finally easy to bridge the knowledge gap and allow utilities to capitalize on all capabilities presented for their asset investment. 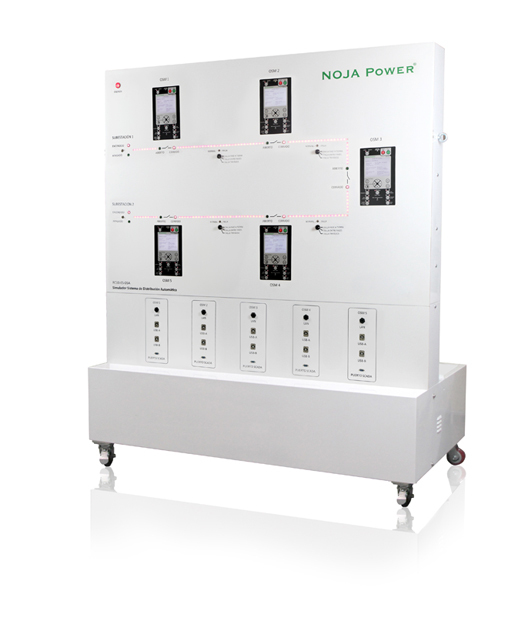 Finally, the capability to configure these five devices in an IP network unlocks the potential for demonstration and familiarisation with NOJA Power’s most powerful automation tool, NOJA Power Smart Grid Automation (SGA). No longer does a utility need a complicated test setup to organise signal injection into multiple reclosers to share information and demonstrate automation algorithms. The DSA Simulators’ capability to explore and trial the subscription and publishing of information shared between reclosers allows utility engineers unparalleled access to SGA control and automation algorithms. When it comes to recloser controllers, the only thing better than one NOJA Power RC10 is five of them. NOJA Power’s DSA Simulator empowers utilities to train personnel, analyse and develop advanced automation capabilities through an intuitive interface. This level of unrivalled training, design and simulation capability is the key to efficient optimisation of distribution network assets.